Jean was born in 1930 in Ryhope, and lived in Ryhope, with her mother and father, they had three children and grandma lived with them too. She started school at Ryhope Infants progressing to Intermediate School until leaving education. She went to work at the Cooperative store at 14 years old, after passing the entrance exam. This was very convenient as the “store” was within walking distance of home, just over the recreation field. Recalling clearly her first day working at the Coop, she describes walking through the front door of the store, (however, usually employees would not use the front door, but enter through the back) with the tobacconist kiosk in front, the door to the back shop and staff rooms on the right, the selling counter and display of goods on the left. Given the task of weighing out “Carlins” (dried peas) into pound bags on her first day, and while she was doing this found several small stones which she isolated, but when the Manager/Foreman came to inspect her work, she was told to mix these in again, “after all the Coop had bought them “.. So much for integrity and unadulterated food!! Jean describes the lay out and working conditions as being most saleable items being on display, everything was stored loose and weighed in the shop, only margarine prepacked, Red or Gold Label. Mr Paisley and Mr Bowman were the supervisors in the store, and taught and trained the staff. She was taught how to butcher a side of bacon, by Mr Thompson the manager of the butchery, the sides of bacon had to be carried up from the cellars beneath, no fridges, and no lifts. The cellars below stored cheese, meat, the paper cellar which stored greaseproof paper and bags, the dry goods all kept separately. Every day the delivery orders were the priority, these were weighed, checked; then parcelled up in brown paper and tied with string. The parcels were laid in the middle of the shop floor ready for collection by the delivery horse and cart. Even at the young age of 14 years old, Jean’s, trustworthiness, reliability, intelligence and head for figures was noted and she was asked to accompany the deliveries, riding on the cart beside Mr Elliot, with the horse Lion. Mr Elliot would carry in the order parcel and Jean would collect the money or the customer would pay later in store. From there Jean started Cash Collecting in Grangetown, with Mr Bob Cutter, it was during the war and therefore it was Blackout conditions. Jean and Mr Cutter would walk from Grangetown to Ryhope (approx. 3 miles) in the dark to then pay in the collected money to the office, where Mr Robson at the main store would count it out. She remembers a discrepancy of 2d 3 farthings short of her total once, she had to put this in to make up the total, Jean’s Dad went across to the office to complain, but was told the money had to made up. However, when she collected over the amount she was never given back any surplus. Recalling when working on the sales counter, the shop closed at 7.00p.m on a Friday night and all the store staff were put onto the sales counter to clean and finish up at 6.30p.m. Annoyingly, two customers, who she knew lived very near, would come in at 6.55 p.m. delaying everyone to serve them, but they could never be refused entry by the doorman as they had come into the shop before closing time . When the men returned from the war, all the female shop assistants were moved across to other departments to allow work for the men. Jean moved to working in the Café. Mrs Harbottle was the Manageress; the only lady with a senior position, she introduced a 10’o’clock and 3’o’clock break, making brown sauce sandwiches as a treat. No women were working on the shop floor then, all men; the only lady who collected the Milk Tokens, yellow, blue or green. Jean remembers if anyone worked overtime, came in early or worked late waiting for deliveries that large jugs of tea with slices of bread and butter were made for the workers. But you were only allowed a 10’o’clock break if you had been in store from 6.30a.m. She worked at the Coop until she was 20 years old, she was married on her 20th birthday and left employment after this, as married ladies weren’t allowed to work at the store. Jean was a member of USDAW union, paid 1s6d a week in subs. The only perk is the third off discount she and her future husband had to buy their bedroom suite. It was made to order in Pelaw factory, they had to wait 6 weeks for delivery. The Cooperative organised many outing and trips from the store, Scotland, the Lake District, she had great fun on these. The Store Hall was used for many community activities, dances held every month, the Church Sale of Work, with tables for the Scouts, Guides, Mothers Union, Young Wives, the Sewing Club all had stalls to sell their homemade wares. The “store” was very much at the heart of the local community. Jean has many affectionate memories of working at the Coop in Ryhope. Being born and bred locally she knows most of the families of old Ryhope. She knew my Grandparents, who shopped at the Co-op for many years, asked if I was named for my Grandma Olive, which I was, a couple of years younger than my Mum, but she knew my Aunt very well. 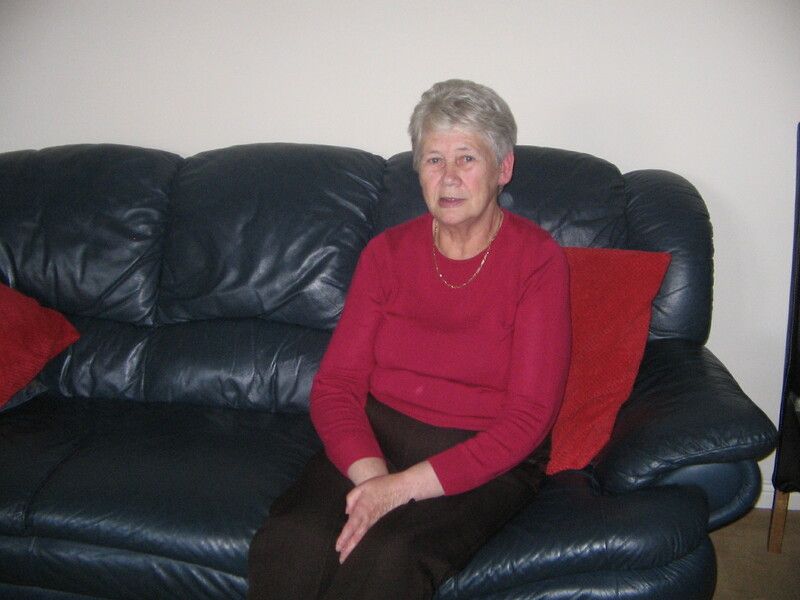 Jean has always been a dedicated and active member of our church St Pauls, a well-respected, friendly – a lovely lady.